You’ve probably heard about the importance of oral hygiene all your life – brush twice a day, floss once a day, eat fruits and veggies, and avoid sugar. Easy enough, right? However there are deeper reasons to follow these guidelines beyond pearly whites. It’s no secret that gum disease comes from bacteria in your mouth, but the same bacteria that cause gum disease can affect other parts of your body such as your heart, brain, pancreas and more. Spit may be gross, but it’s part of your body’s defense system. Chock full of antibodies and histatins to ward off viral pathogens, your saliva traps initial invaders that try to enter your system. This means your mouth is a good way to judge the overall flora inside your body. For example, 90 percent of systemic diseases produce oral signs and symptoms. Your spit is a powerful trap that clings onto bacteria as well as drugs, environmental toxins, hormones and antibodies. That’s how physicians test for data like Cortisol levels or bone-specific proteins for osteoporosis patients. While saliva is useful for your body’s immune system, it can’t do everything. Bacteria that survive your mouth’s defense systems form plaque that clings to your teeth and cause problems like gingivitis, periodontitis and trench mouth. When these microscopic pests build up in your saliva and on your teeth, it can affect your gums. If left unchecked, the plaque buildup they create can cause gum disease. Severe gum disease doesn’t just end in missing teeth. Oral infections are linked to poorly controlled diabetes, cardiovascular disease and preterm birth. Furthermore, the bacteria that cause these diseases can enter your bloodstream during invasive dental treatments and sometimes, normal brushing and flossing. Once these pathogens enter your bloodstream, they can affect your arteries and strain your heart and other organs. Some diseases are linked to poor oral health, while other conditions make their hosts more prone to gum disease. If you have a poor hygiene routine for long enough, you might be prone to endocarditis, cardiovascular disease and, for women, risky complications during labor. On the other hand, conditions like diabetes, HIV/AIDS and osteoporosis can lead to gum disease without proper oral care. The best way to prevent these issues are the same methods you’ve heard all your life – brush twice a day with fluoride toothpaste, floss, eat healthy, replace your toothbrush frequently, schedule regular dental checkups and avoid tobacco use. Electric toothbrushes aren’t anything new on the market, but they’ve seen vast improvements over the last decade. There are so many choices available, it can be hard to know which features are bells and whistles and which are useful. Everything you need in an electric toothbrush can be condensed into three categories: design, features and portability. These categories go hand in hand in manual and in electric models. No matter what type of electric toothbrush you get, it needs to be comfortable to hold and easy to maneuver. Massage brushes with smaller heads are often better for mouth feel and can clean tight spaces more effectively. Most adults need a toothbrush with a head around a half inch wide and one inch tall. Soft bristle brush heads are also the dentists’ choice because they do not damage gums, especially for those aggressive brushers. Of the brush head types, look for models with a rotation oscillation. These round-headed brushes pulse and spin, allowing you to focus on one tooth at a time and rotate up to 8,000 times a minute. This makes them more effective than other styles. 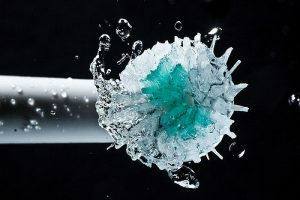 Not all electric toothbrushes are created equal, but in the end, a toothbrush is only as effective as your brushing technique. That’s why there have been new models sprouting up that help you improve your own brushing skills. Look for the two-minute timer feature that will help you get the minimum brushing time in and whiten your smile. Other common, useful features include charging stands, travel cases and different settings like massage or sensitive modes. You should also remember to replace brush heads every three months. The less expensive, battery operated models last about two weeks with a normal brushing, creating a hidden cost in replacement batteries. Look for brushes with replaceable heads, you’ll need to replace your brush every three months or so. If you travel often, portability is an important quality to look for in an electric toothbrush. Even if you aren’t a frequent jetsetter, you still need to brush your teeth while you’re away from home. Depending on the power source, a toothbrush can become unwieldy or come with extra components to pack. Many budget friendly models use batteries while those on the higher end usually use charging stands with cables. The rechargeable models are often better performers, but battery operated models are more portable and less expensive. While we know that not taking care of our oral health will be detrimental to our teeth, did you know that it could influence the health of your entire body? Poor dental health can have greater consequences on your overall health than you may realize. Take a look at some of the biggest problems that can arise from neglecting this part of your body. Brushing your teeth at least twice a day, morning and night. This is the simplest and most effective way to rid your mouth of bacteria and plaque before it has the chance to do damage. Flossing is just as important as brushing for your health, but an alarming number of people don’t floss on a regular basis. It is estimated that only half of Americans will floss their teeth daily. This is essential for getting rid of any leftover particles between the teeth. Scheduling a dental appointment for every six months can help detect problems before they become serious. More than a third of the American population did not have a dental appointment in the last year. Eat the right foods that will promote healthy teeth and gums rather than causing more advanced problems. These four steps together will be key in preventing the following health problems. Halitosis – bad breath is often a complaint from many that can be taken care of with proper oral hygiene. Often when food gets stuck between our teeth and as they collect bacteria they begin to smell. Flossing and brushing together can remove these particles, reducing this occurrence. Atherosclerosis – when there are high levels of bacteria that can cause disease in your mouth, it can cause the clogging of the Carotid Artery. This can lead to serious problems, including the risk of stroke. Heart Disease – people who have periodontal disease (a bone deterioration around the teeth) have a higher risk of developing heart disease. The periodontal bacteria and plaque will enter the bloodstream from the gum, causing the arteries to narrow. In addition to this, cholesterol levels can rise in the face of gum disease and cavities. Diabetes – Almost all adults, about 95%, who have diabetes also have periodontal disease. This can be the first indicator for this dangerous condition. These are just a few of the health consequences that come when your teeth are not properly cared for. Make the changes in your dental hygiene to prevent more serious problems down the road. Your teeth are important to your overall dental health. Your permanent teeth should be attended to throughout your life, as they are the last set of teeth you will have. While professionally whitening your teeth is always a great way to keep your smile fresh, there are things you can be doing at home to maintain a healthy smile. Follow these tips for a whiter, healthier, and all around better smile. Water is essential to good health. It is essential that we drink enough water for many reasons, one of which is saliva production. This substance protects our teeth from bacteria, flushing away cavity causing agents. In addition to this, get into the habit of drinking a glass of water after every meal. This will rinse away acids, bacteria, and other elements that are a potential threat to your teeth. While sugary gums are bad for our teeth, sugarless gum can be beneficial, helping to keep your teeth clean. As we get older, our mouth’s ability to produce saliva diminishes. This can lead to tooth decay if nothing is done to prevent it. By chewing sugarless gum, you can stimulate the production of saliva, protecting your teeth from decay. We often think about our diet in terms of the foods we eat, but what about the drinks we consume? Not only do some of these drinks have high concentrations of sugar and calories, their coloring and acidic composition can be dangerous to your teeth. Those who drink coffee, red wine, tea, and certain energy drinks will eventually start to notice stains on their teeth. Either cut down on these beverages or instead drink them through a straw to better protect your teeth from damage. Vegetables are good for our health for a number of reasons. As opposed to fruits, most vegetables are low in sugar. When raw, these foods can act as a scrub against your teeth, cleansing and removing harmful stains and plaque. Find some vegetables that you like and can incorporate into your daily diet for healthier teeth. There are many changes you can make in your life for a healthier whiter smile, and these are just a few. Make sure you take part in the changes now that will make an impact in your dental health over time. By doing this, you will have less trouble down the road in keeping and maintaining a healthy smile. Another wonderful year is coming to a close. We have enjoyed getting to know each of our patients better throughout the past year and look forward to our visits! 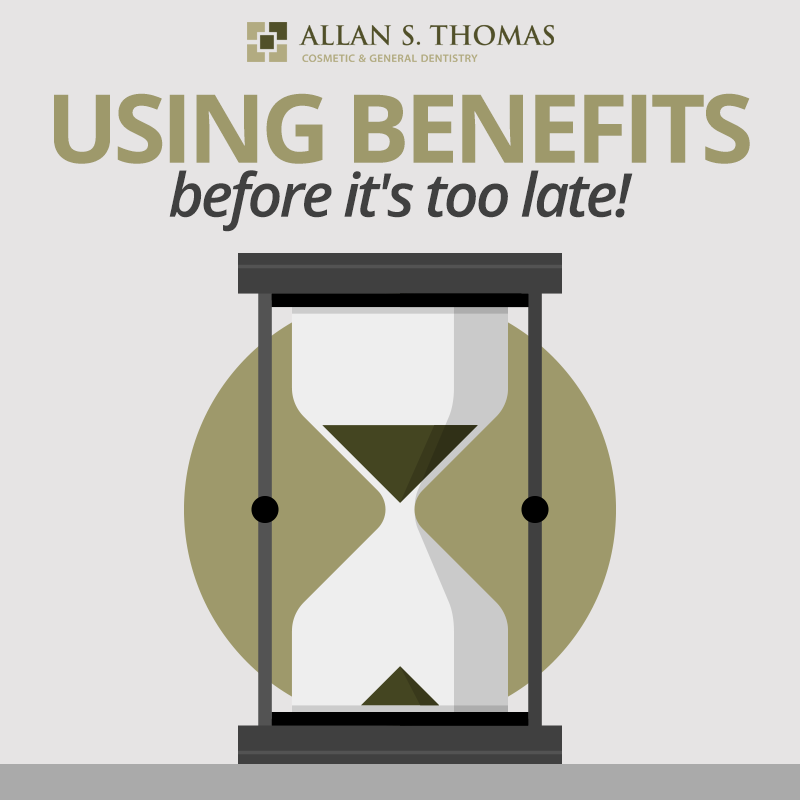 As we get closer to 2015, it is important to look at your insurance benefits still available for the 2014 calendar year. We have sent out letters to those who, according to our records, still have these benefits available to them and must use by the end of the year. If you have received one of these letters, it is time to start looking at your options for the end of the year. Check your records and see what benefits you have left in your insurance plan. These advantages can be used for regularly scheduled visits, or more advanced treatment. If we have talked through a treatment plan with you, let’s get you in to complete the work, benefiting your oral health and subsequently your overall health. We look forward to working with each of our patients, helping them achieve their ultimate health goals. Together we can help you achieve these oral health goals by the end of the year, or at least gain significant headway in the process. Don’t let these important dental health benefits go to waste by waiting too long, we want to work with you to take full advantage of these! Call our office to schedule your treatment as soon as possible. We want all our patients to know just how much we value your trust in our services, and your loyalty to our practice. It is an honor and pleasure to be on your healthcare team.